I noticed that my power steering fluid level has been dropping slightly from when I changed my fluid about 6 months ago. I did the whole process of removing the return line and putting fresh fluid through until it came out of the return line. I also made sure to bleed the air out by turning the steering wheel lock to lock. I've noticed that over the past few months that my level has been dropping slowly from where I topped off the reservoir at the Full line. I've noticed that there is some sticky residue which I am assuming is power steering fluid around my cap. 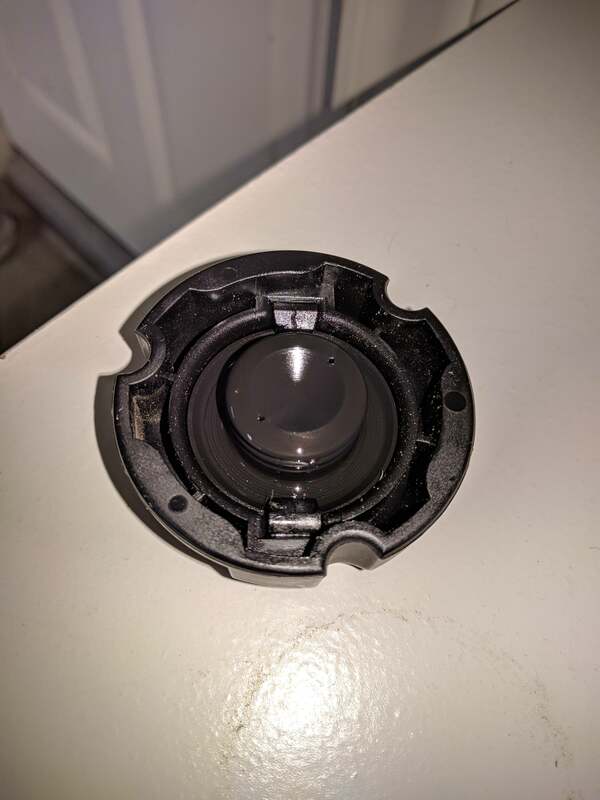 I'm guessing my cap or reservoir is leaking, but when I take the cap off I don't see any obvious signs of damage on the cap and it also seems to screw on securely. Also, not sure why power steering fluid would be forced out like that..unless I'm underestimating the pressure the fluid is under in th reservoir. Has anyone had this issue with their power steering reservoir? I'm planning to just replace the cap, but I want to make sure I'm not barking up the wrong tree before I try anything. Should be no pressure in the reservoir and low pressure on the return line. Do you think a new cap would help? The cap is vented so a new cap would probably do the same. It's almost like there is air bubbles in the fluid. Hmm, ok. I guess I can try purging air from the system again by turning steering wheel back and forth a few times with the cap open. I thought I did a good job of this when I changed the fluid a few months ago, but maybe not. Not sure if air could be entering from somewhere else. Not whining is it? What fluid did you use? Not whining as far as I've noticed while driving. I'll open the hood and listen for that with the car running. I used Pentosin CHF 202 as specified in the owners manual. Air could be made if the pump is cavitating but I think it would make noise. Maybe run the level a bit lower? Notice how the reservoir is not mounted level. I could just run the level lower like you said. I suppose as long as it is within range when it is cold there will be no issues. The reservoir looks level to me, might just be the way I took the photo. I tried tracing the lines as best as I could and didn't see any leaks or anything. PS fluid level hasn't fallen fast enough to indicate anything severe. It's slowly dropping over a few months. I also don't hear any whining in the pump or anything like that. I'm at a loss of what else to do to figure this out. Is this something that Hyundai would likely cover under warranty? I'm also willing to leave it alone and top off fluid as needed, but worried that there will be damage to the power steering pump over the long term by having air in the system. I'd drain the whole system and start over again if it were me. 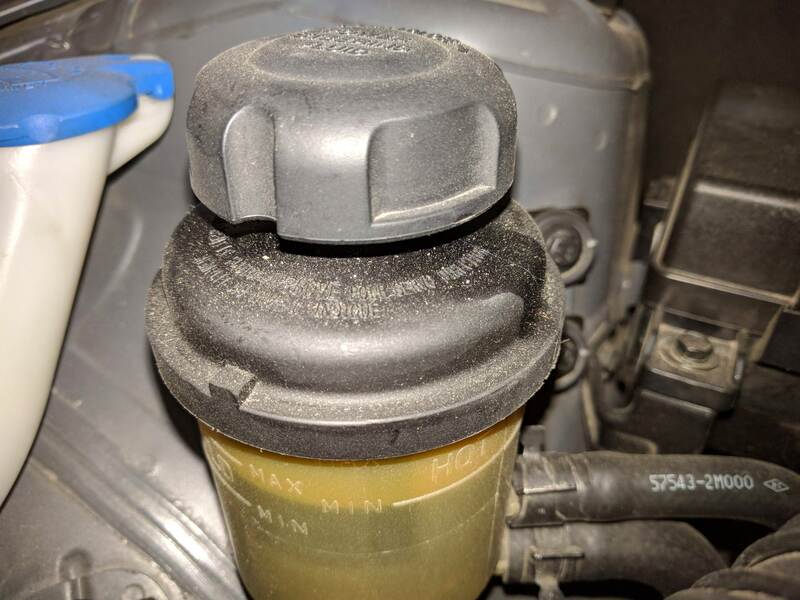 There's gotta be air in the lines thats being forced out through the cap which is why there's a build up at the resivior and why the fluid level is dropping. Which would also mean there's gotta be a leak somewhere that's letting air in. I haven't had this problem on my GC but my Acura did have a problem like this and for the longest time I couldn't find any drips on Tuesday ground. I finally found out the fluid was building up in the frame rails through a hole and was basically just a pool of power steering fluid in my frame rails. Not saying this is the case with you but it is something to consider. Is there a reason you recommend draining and filling the system over again? I've replaced most of the factory aluminum tubing with regular hose on the return side of the system. The factory tubing is very thin and easily damaged or have a hole wear in it. It does help cool the fluid. I also put in a small tube and fin in front of the radiator and took out the factory 'loop'. Last edited by Red Raspberry; 1 Week Ago at 12:26 PM. You could have some air trapped in the system that's not working it's way out. That's why I mentioned draining and refilling again.